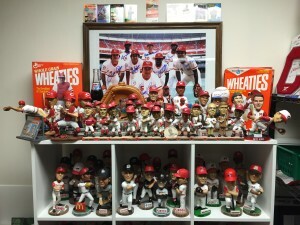 Description: Zachary began collecting Cincinnati Reds SGA bobbleheads in 2005 at the age of 10. Since then, he has gone to every Reds giveaway game. During that time, he tracked down one of each that were given away before he could attend the games. 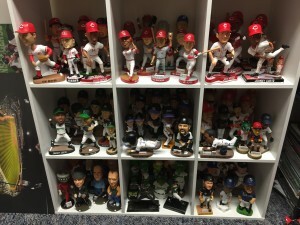 Other Information: As of the end of the 2015 season, Zachary has all of the Reds SGA bobbles. Once he had caught up on these, he turned his attention to the Reds minor league affiliates. Zachary has a set of all the Louisville Bats bobbleheads through the 2014 season, except for one. He was able to travel to Louisville for most of these. Zachary also has a complete set of all of the Reds affiliated Billings Mustangs bobbleheads. Most of these were found online due to the distance. He has yet to pursue 2015 minor league bobbleheads. Zachary has acquired all of the bobbleheads given away by the Cincinnati Reds Hall of Fame. He has most of the bobbles from the Dayton Dragons. These are not SGAs. They are limited to season ticket holders, so they took more work to find. 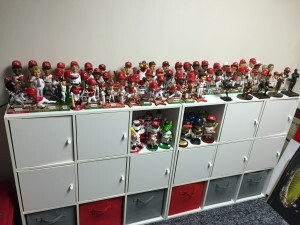 His collection also includes miscellaneous Reds bobbleheads, Chattanooga Lookouts, Bakersfield Blaze, Sarasota Reds, Pensacola Blue Wahoos, and a few bobbles unrelated to sports. As a side project, five percent of Zachary's bobbleheads have been autographed. His displays show some other objects, but the count of individual bobbleheads comes to 207. Zachary's twin brother has a very similar collection. Storage is quickly becoming an issue for him as he has no plans to quit collecting!